Perennial. Zone 2. Malvaceae. Europe, North Africa. When I was recently listing all of the “old faithful” nursery plants we seem to offer year after year after year, the Musk Mallows, pink and white, were at the very top. And I doubt this situation will change, for Malva moschata is one of the easiest perennials there is, though it does have its faults, the main one perhaps being its relatively short life span, which is balanced by its willingness to self sow, which is in turn balanced by the ease with which the seedlings can be recognized and removed from unwanted areas. Musk Mallow is so named for the scent of the foliage when bruised, moschata meaning “musk-like”, though I must say that I have never particularly noticed much more than a general “green” scent when I have occasion to work with this plant. It was once apparently used quite extensively in perfumery. 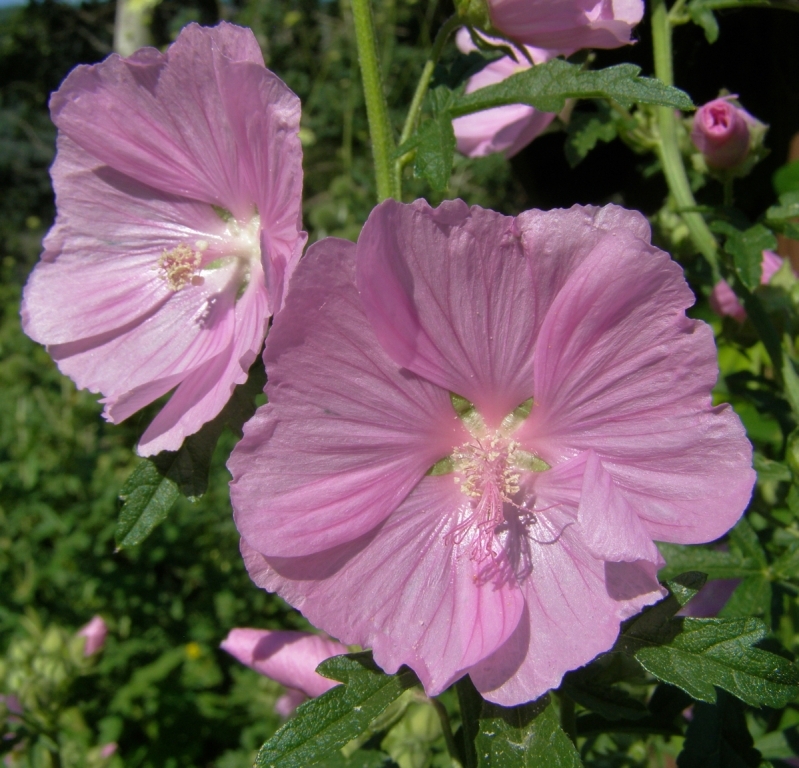 Unlike other useful plants that were abandoned once they were no longer valued for their healing properties, the Musk Mallow was a favourite ornamental throughout the eighteenth and nineteenth centuries. The elegant white form, ‘Alba’, (was) appreciated in the flower border for (its) beautiful and plentiful shimmering blossoms and accommodating habit. The pink-flowered Musk Mallow, Malva moschata ‘rosea’, is a vigorous plant, making handsome, multi-branching clumps to 4 feet tall and 2 or 3 feet wide. Foliage is bright green, and deeply cut in rounded lobes. Clusters of buds appear in the leaf axils in June, and quickly open into silky-textured, saucer-shaped blooms with prominent bosses of pale yellow stamens. There are different degrees of mauve-tinted “pinkness”, from the pale cultivar ‘Appleblossom’ to the darker ‘Rose Perfection’. The white-flowered Malva moschata ‘alba’ is a slightly smaller plant, reaching 2 to 3 feet in height. The blooms are white with delicate pink veining, and a blush of pink in the center. ‘White Perfection’ is the cultivar most commonly found. 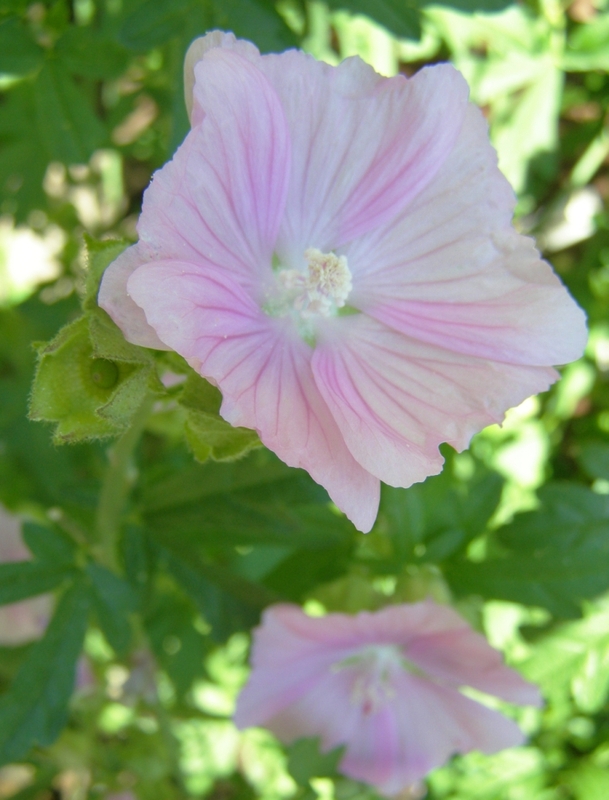 The basal stems of Musk Mallow can get quite woody by autumn, and mature plants are rather shrub-like in effect. They bloom and bloom and bloom, with new flowers appearing along with the clusters of papery seed pods. If Musk Mallow gets out of hand and starts to lean a bit too heavily on its border neighbours, it can be shorn quite severely in midsummer, and will then cheerfully respond to this rather brutal ‘housekeeping’ by putting out fresh growth and a whole new crop of flowers. It will still be in bloom up to the final hard frost which ushers in winter. New York gardener Louise Beebe Wilder, one of my very favourite botanical writers, published a book in 1935 entitled What Happens in My Garden, in which she has kind words for the Musk Mallows. While the Hollyhock is undoubtedly queen of its tribe, some of its cousins are of passing charm. My favorite is the Musk Mallow, and the white Musk Mallow for choice, Malva moschata. They grow about two feet tall, bloom prodigally through July and August and sometimes into September, and the wide flaring blossoms borne in quick succession at the ends of the branches have a fine satin finish that is very attractive. The leaves are cut and cut again, and the plant has a nice bushy, space-filling habit. It was Miss Jekyll who suggested the cool and charming association of white Musk Mallows and steel-blue Eryngiums, one of the most pleasing of summer companionships. And I have found both the pink and white kinds delightful…(T)hese plants are friendly and blossomy when these attributes are most wanted. Musk Mallow is wonderfully appealing to bees and other pollinators. It also makes a good cut flower. In general, an easy and appealing old-fashioned flower, happy to play a long-blooming supporting role in the perennial border.